What to look for when buying ski and snowboard locks? What do you intend to lock up? When you are headed to your favorite ski or snowboard resort, you are bound to make stops along the way perhaps for fuel refill or to grab a few things. If traveling by air, you may not be lucky to travel with all your luggage as carry-ons. Once you arrive at the ground and the action is on, it’s a cinch you’ll take a breather at one point or another. All this while, you need to safeguard your expensive equipment, otherwise, you ruin all the fun. Ski and snowboard gear have such high value attached to them that losing them to theft would be very unfortunate if not downright disheartening. This is why you need to take every measure to keep them safe, whether you are at the resort on a break or parked at the station to refill gas. And a good quality lock will do this just fine thereby giving you the peace of mind that your items are safe. Comparing the cost of losing your equipment to the cost of investing in a locking system, the latter is obviously the better cost. Apart from just securing your items safely, ski and snowboard locks help you organize your space. For instance, if you are traveling, a locking mechanism for your car’s roof rack will help you pack up the larger items with unwieldy shapes at the roof of your car, leaving ample space on the inside for comfort and for other items. When choosing the right ski or snowboard locks for your equipment, keep in mind the following important factors. People have different needs. Some need the locks for their work equipment, others for residential applications such as securing their gate and fences, others need it to secure their recreation equipment when traveling or when at the resort. Still, others need locks for securing their luggage when traveling. Ski locks come with varying designs and are built with different capacities. Some equipment needs very specific locks. The idea is to know the purpose for which you need a lock, then getting one that matches this purpose. How many skis or snowboards do you intend to secure? The smaller models will secure fewer skis or snowboards compared to the bigger ones. In this regard, check the cable length and diameter. A strong lock is not necessarily heavy. Consider weight from two perspectives. First, the weighted grade of a lock defines its capacity to secure specific gear. Secondly, is it light enough to be portable? The most popular locking mechanism is the personalized digit combination mechanism. Most locks have 3-digit combination codes and a few others will come with 4-digit combination codes. Agreeably, these are easy to remember combinations and works well for most people. Another category is the key lock mechanism. This resembles the manual key locks. Set your gear on a rack within rails and secure them by locking them with the key. You need to be careful to keep your keys safely to avoid losing them. Our review today rounds up 9 of the best locks for your skis and boards. Whether you are traveling in a plane, securing them against a fixed object, locking them up on your car’s roof, or keeping them safe on the resort’s ski and snowboard racks, you need a lock that matches your safety requirements. Let’s delve into features that make these lock tick. Dakine’s Micro Lock is lightweight weighing only 0.1 lb and small enough to fit in your pocket. It comes with a 3-digit combination code and a 30-inch retractable cable that can secure up to two snowboards. It presents a great option for your skis and boards but not the best for bikes since it is too thin and can easily be cut using a wire cutter. However, it will deter opportunistic thieves in open or public spaces. It comes with an easy-to-operate button which is what recoils the cable when not in use. The micro lock’s cable is made of steel coated with urethane to give it a longer life free from scratches. This is housed in a tough plastic that will keep you going for years to come. The ET-152 cable lock is a good option if you are looking for a rugged lock. 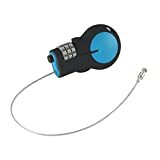 It features a lock hook made of durable zinc alloy with high resistance to corrosion and a coiling metallic cable coated with PVC plastic to keep it from scratching. The 2-mm cable stretches to 59 inches when in use and retracts back when not in use, making it easy to carry around. Weighing just 0.2 lb, this cable lock is pretty lightweight. ET-152 cable lock comes with a 3-digit combination code which you can set to your own personal code as many times by simply resetting it when you need to change. 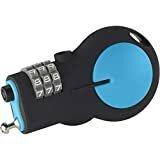 This lock is a great option for tying up your skis, helmets, luggage, and saddles in public places but not so much where a thief finds an opportunity to use a wire cutter. The Master Lock’s 460 D cable is a good option for both outdoor and indoor applications since it is built for a wide range of utility. You can use it for your backpacks, skis, snowboards, skates, strollers, and more. This lock comes with a 36-inch retractable 2.4 mm braided steel cable with a vinyl coating to prevent scratches. This cable is operated by an inbuilt push-button mechanism that retracts it into its housing when not in use. It also features a 3-digit lock code which you can set to your preferred personal combination for security. This lock comes in a range of color options including blue, green, red, and white to fit your taste. Bosvision’s Ultra-Secure retractable cable lock stands out for its 4-digit combination code which gives you up to 10,000 combinations that you can reset and change when there is need to deliver tighter security. It features a 36-inch retractable steel cable of 2.4 mm in diameter, which is coated with vinyl to prevent scratching and which recoils with the press of a button. This cable retracts into a lightweight but durable ABS housing. 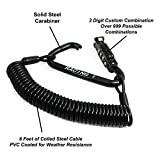 This cable offers adequate security for bikes, skis, snowboards, pushchairs, strollers, and other items by attaching them to a fixed object hence giving you some peace of mind wherever you go with them. It comes with three color options, black, orange, and green for you to choose from. This cable lock by Lewis N. Clark is a great safety asset to your travel since it is built to lock your bags or luggage together or secure your briefcase or suitcase when traveling. Still, it is good for securing items like skis, snowboards, gates, guns, laptop bag, and other work tools to a fixed object. This cable lock features a good-grip durable thermoplastic rubber and ABS plastic housing. Inside this housing is a retractable 30-inch braided steel cable that’s coated to protect it from scratching. It features a 3-digit resettable lock code. The LuminTrail cable lock comes with TSA approval which allows TSA agents to unlock your luggage, check them, and relocked without interfering with the cable lock. This makes an excellent option as a travel lock since you will not hassle or have security concerns during luggage inspections. You will rest assured that the only people with access to your equipment is you and TSA agents. 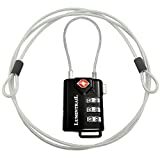 The LuminTrail TSA cable lock comes with a 5-inch cable that runs from end to end which is suitable for suitcases, briefcases, and travel bags along with another 48-inch cable for securing bigger items like skis and snowboards. Both cables are made of strong durable 3 mm coated steel and the steel shackles at the ends act as added security since they are hard to cut or break. This cable lock is designed with 3-digit combination code and an inbuilt reset mechanism. It also features large black numbers on a silver dial which makes them visible and easy to read. It comes with three color options for you to choose from, red, silver, and black. This cable lock by Precision Works Racing 1 is a great option if you are looking for a versatile lock. It can be used anywhere from securing gates and fences; motorbikes and bicycles; machines like lawnmowers; to securing sporting equipment like skis, snowboards, helmets, and many more. This it does quite well thanks to the longer than usual 72-inch braided steel cable with PVC coating with excellent weather resistance properties. This cable recoils when not in use to allow you to move around with it in your pocket easily. 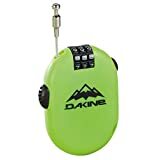 It comes with a 3-digit resettable combination lock that hooks to the cable using a strong steel carabiner making this cable lock one of the toughest and best snowboard locks to guard against both opportunistic thieves and wire cutters. An advantage that this key offers over the cable lock system is that fact that it is not easy to cut even with a wire cutter. This gives one the peace of mind that their gear is safe wherever they go. This ski lock will benefit you in resorts that provide ski and snowboard storage racks. Simply place your skis on the rack with their tails passing through the rails then lock them securely with the ski key lock. Each lock comes with two keys and is available in 5 color options. Whether you are using a key lock or a cable lock, you need to secure your skis and snowboards to avoid losing them to theft. The best ski lock is built for broad functionalities in different environments, with the core purpose being safety. More than this it needs to be durable and also tough deterring both petty thieves and those with wire cutters. This, however, depends on where you will be using your lock. If in an open public area, perhaps it will make sense to invest in a locking mechanism that bars opportunistic thieves. Bottom line, get what works best for you. We have only given an outline of what it takes to make an informed choice.